Home / Worth writing about… / All / A Sydney craftivist uses us as inspiration for her degree show and beyond! A Sydney craftivist uses us as inspiration for her degree show and beyond! My name is Georgia, I’m from Sydney Australia. I only just found out about Craftivism a short time ago and I think it is amazing and so inspiring! I’m student at Sydney College of the Arts doing my honours year in jewellery, having done my bachelor in textiles. I found out about Craftvist Collective whilst doing research for my honours paper. I am researching capitalism and globalised labour and trade, thinking about the hand made object vs the mass produced and why hand skills are becoming less valued in the society I live in. I’ve been so inspired by what I’ve seen and read about Craftivist Collective, I am now writing about Craftivism in my paper. I recently made a presentation to my class about my research. I spent a large part of the seminar speaking about Craftivism and Craftivist Collective and also sweatshops and the sort of corporate colonialism that occurs with transnational companies exploiting poorer nations for cheap labour and resources. I showed images of some Craftivist Collective works as well as the mini protest banner kit that Sarah had kindly set out to me. The class responded really well, people started talking about things they had seen on the street and art works they knew that related to Craftivism. People also said they thought this type of work was effective because it implicates all of us in problems that are easy to pretend we don’t take part in. The class I am in is made up of jewellery, glass and ceramics students, so we are all ‘crafters’ in a way and I think it was really inspiring for the class to see craft being used in a meaningful and political sense. This same group of students put together an exhibition ‘Are We There Yet?’ which showed at Gaffa Gallery in Sydney during the first two weeks of July. For my piece in the exhibition I made two wearable mini-protest banners, one in the form of a brooch and the other a necklace. I used the cross stitch pattern from the kit Sarah sent me and stitched the slogans into copper shim (very thin copper sheet that can easily be cut with scissors, pierced with a needle etc). 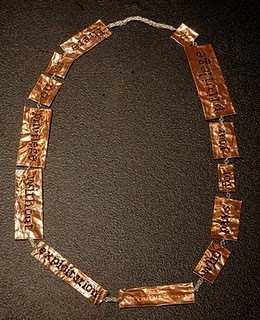 I liked the idea of adapting the mini-protest banner into jewellery because I thought it was another way of getting the messages out into the public space, some private spaces too, and that they could hopefully be conversation starters if people engage with the wearer and ask about what the piece means. This was also the case at the exhibition, so I had the chance to tell people about Craftivism and Craftivist Collective, and I also included the website on the room sheet where the artwork was listed. So thankyou Sarah and Craftivist Collective for inspiring me and supporting me in my project, I think the work you are doing is really important and I will keep spreading the word as much as I can!